I run a seminar in Finland at Microsoft Finland office 23rd of November for Microsoft ISVs about the transition to the cloud and what it means for software vendors overall. 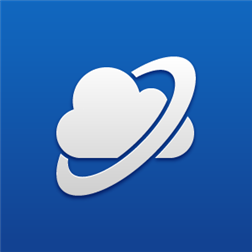 One of the key things in my messaging for ISVs is that they have to look at the cloud together with mobility going forward. This morning I run into an article in Information Management web-site where IDC predicts that mobility and cloud will surge in 2012. It is easy to agree to this based on what we have seen in our work and research specifically in the US continent. IDC predictions are based on 1000 IDC analysts and according to this study, cloud spending will top $36 billion next year which is four-times the overall IT industry rate of growth. Another interesting statement from IDC chief analyst Frank Gens is that there will be a “generational shift in the tech platform adoption and innovation” which could according to him lead to a worldwide IT spending of $5 trillion by 2020 and all of this based on mobile tech and the cloud. Based on hundreds of discussions with independent software vendors (ISVs) around the world we have seen a clear shift in the urgency of many ISVs to ensure that they are on the right bandwagon concerning the cloud. My colleague, Juha Harkonen has been analyzing the trends for quite a while and the observations that he has made are very interesting. You might want to check some of his observations from his excellent blog. I knew we would get to this sooner or later as the move is definitely towards the cloud and ISVs that are resisting this move, will eventually run into issues if they do not re-architect their legacy solution as clients will require a true SaaS solution and not a solution that is “running in the cloud” but without really taking advantage of things such as scalability etc. The Gigacom.com article concludes that it is not a surprise that enterprise vendors acquire smaller SaaS players such as the acquisition of RightNow Technologies by Oracle (1.5 billion). I work with ISVs around the world and I have seen many different types of organizations, some of them being start-ups and some making the transition from legacy business to SaaS business. One very popular way for traditional ISVs to make inroads to SaaS game is to build some type of an extension to the legacy solution to get experience what it is to build for the cloud and this also gives a more evolutionary way of creating something that can be sold to existing customers as add-on service. I think each and every software executive should contemplate on the message from Gigaom and Martin Wolf especially if the company is in the game of getting sold in the future. The times of high license revenue with maintenance and support is gone and will be sooner or later replaced by monthly/quarterly recurring revenue where the software vendor has to create a solution that is not only used but loved by its users. Gone are the times where a software was sold that was both unfriendly to use but as the software vendor got its money, there was no incentive (other than getting the annual maintenance and support fee paid after first year) to ensure that the software was something that the buyer really liked. In the old-fashioned model, the company paid a large lump sum for the software and this was almost always a lock-in from the software vendor as the end user organization is always fully invested in the solution and is almost forced to pay the maintenance fee in the end. I do remember vividly when I was CEO for a business intelligence company when I was always worried whether our largest clients would pay the support/maintenance fee in the beginning of each year. What is needed for traditional Independent Software Vendors (ISVs) to move to the cloud? If you have not heard enough of the cloud and its importance, you have probably been sleeping or being ignorant of what is happing in the IT industry. I have to say that I am unbelievably excited of having the opportunity to be part of this change and there are many reasons for this. The first and foremost is that the cloud has brought the software industry something new and exciting and a reason to re-learn a few things that keeps the innovation happening in our industry. I have lived three different IT industry eras: the minicomputer, client/server and dot.com era. The latest and very much transformational will create a new generation of solutions/applications that we all will somehow benefit from. I still hear from many ISVs that “this is nothing new as we have had managed services for years” demonstrates that these naysayers do not really have the understanding what the cloud will bring to the table such as “pay as you use”, scalability etc. The cloud platform will give new opportunities for innovation, opportunities that traditional hosting can’t provide. If you are one of the naysayers, you can keep doing that but I will remind you in a year or two about this and let’s see where we are at that point in time. If you are an ISV and have not looked at the cloud possibilities, you could be soon overtaken by a competitor that you would never have expected. There are hungry entrepreneurs that want to take over established vendors that might not be any longer as agile as a small startup can be. 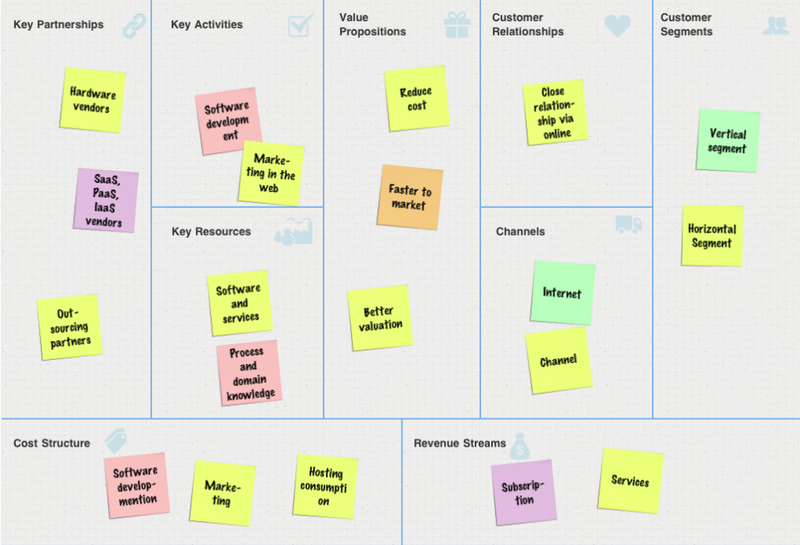 To become agile again, we have to think outside the box and forget about our old routines and thinking and accept that the change is here and that people will be consuming software in a different way that we are used to. I still think it will be a hybrid model where some of the apps will have to live on the device due to usability factors, but most of the data and logic will stay in the cloud. The cloud era has been here for a while and the early adoptors have accumulated experiences that the rest of the IT industry can benefit from. Some best practices can be found from CIO.com and an example of this is an article “Which Apps Should You Move to the Cloud? 5 Guidelines”. My recommendation is to do your homework (=planning) before you go to the execution phase. 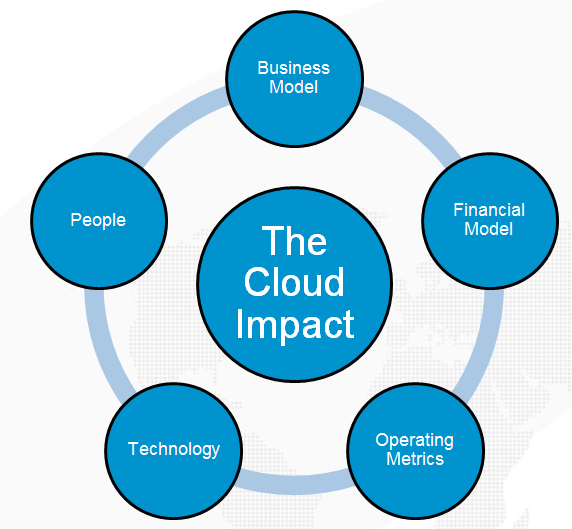 The cloud is different and requires different skillsets from people involved with it. 2) Accept that for disruption to occur, control needs to be given up. The first statement is what I always try to bring up in my workshops. You have to face the reality now and not delay the decision to innovate using the cloud. 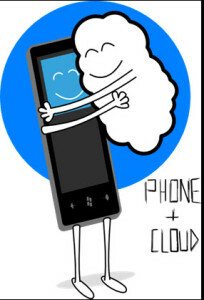 If you do not, you might have the same fate what Nokia had with Symbian platform. The second statement is also important to understand. You cannot control the change, but you have to try to live with it and make the best out of it. The third one is what ISVs usually fail with. If you try to push the “cloud transformation” to the same team that is taking care of your traditional software application/solution, you will not only burn these people; you will also fail in your cloud attempt. Software development using cloud architectures is not the same as developing for the traditional software architectures due to many reasons such as multi-tenancy, latency and also how the application is consumed using different mobile devices. Ensure that the people that are assigned to work on the cloud solution will have the means to do it including sufficient investment and realistic expectations. The forth statement is in line what I have been blogging about for months, where the ISV has to plan how to manage the financial impact on the ISV business with a strong transitioning plan that takes into account the change from perpetual licensing model to subscription-based model where the payments are divided into the contract period. Based on our research and discussions with lots of different ISVs, three years or 36 months seems to be the magic number where the organization should start to see the real benefits of an ongoing subscription-based revenue model. Statement five and six has to do with the change of ISV DNA that I explained earlier in this blog. Remember also that traditional geographical boundaries that you thought kept you secure are also gone with the cloud. End users will test-and-try solutions regardless of location and there is nothing that the IT department can do about it. We have seen it so many times that it is not even funny anymore. 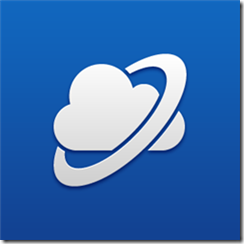 I divided in my previous blog post how a cloud transition will impact an ISV. 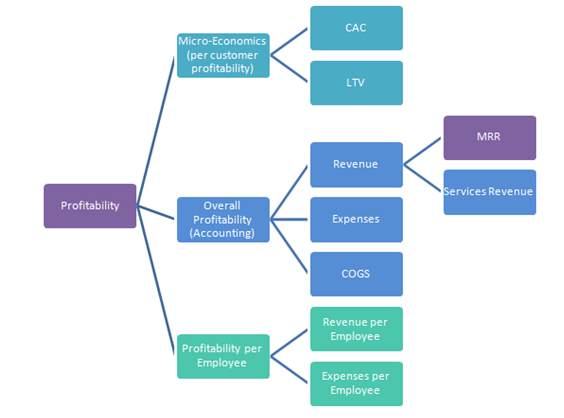 The first blog entry was about the change in business model and this blog entry is about the impact in financial model. However, it is important to recognize that the financial side has lots of different drivers and I will only portray a few of these in this entry, and deal with some others such as sales related metrics later. Independent software vendors (ISVs) have the concern of profitability when running a cloud business. Mature software vendors with ongoing annual maintenance and support revenue are wondering how to make a transition to avoid future cash flow issues. The most typical question that I get from ISV management team members is: “how do we transition to the cloud without jeopardizing our current business?” Unfortunately there is not one and simple answer to this and what nobody wants to hear as an answer is: “it depends”. There are many different variables to consider and some of them are ISV specific and cannot be generalized. It is like comparing two different cars that have a different purpose: one that is used for racing and the other for transportation of heavy equipment. How does one compare these two and what is the comparison metrics? I can still remember my early career when we did a bunch of comparisons between publicly traded companies in my business school using metrics that was regarded as “industry norm”. We had to learn in our accounting class each ratio that could be calculated concerning income statement and balance sheet. When we added cash flow statement to the equation, we were sometimes completely lost… me included. Once I understood the connection between income statement and balance sheet, life become so much easier. I would argue that ISV management has to do the same thing to really get to understand where a cloud business is taking them. I am sure that the ISV CFO and controller are on the right page, but I am not that convinced that the management team members all understand the impact of the change. That is just my observation from both research and talking to a bunch of entrepreneurs. It is obvious that accounting metrics has not changed but was has changed is how we measure our operational activities that eventually leads into the financial accounting metrics that we track and our auditors are interested of. If we change our model from classic perpetual software licensing model to subscription-based model and keep our operational metrics in the prior, I will guarantee that the company will run into a wall pretty soon and one of the things that would be recognizable is that there is no cash in the coffers. Do we really know how to recognize revenue in a way that tax authorities are OK with it? Do we know how to recognize service revenue with a software sale from revenue recognition perspective? You do not want to find this out later on when an audit is taking place or when you are during due diligence when selling your company. The ISV management has many questions to answer. Is your current business and software solution built in such way that it is easy for the current client to move to pure SaaS environment? What is the current complexity of your solution and does it require lots of human interaction to get delivered? Does your solution have lots of integration points to other operational applications? Does your current software solution support a migration to a pure SaaS environment? If it does not, what is the alternative? I am sure you are getting my point here. Running a solution from the cloud is not just to “port” the solution, but it is to have it run natively and I do recognize that this is not easy for many legacy ISVs. What about the financials? The number one term that you need to familiarize yourself with is CMRR (Contracted or Committed Monthly Recurring Revenue), Churn and Cash. Other key metrics are Customer Acquisition Costs (CAC), Customer LifeTime Value (CLTV) and there is a bunch of others that are related to different operational functions such as sales, marketing etc. Fortunately there are lots of good resources in the Internet that I have found very helpful in doing my own research. Many of these examples come with lots of use cases and practical advice so my recommendation to any ISV is not to try to figure these out on their own, but to really learn from what is already known. Some of these resources such as David Skolp that maintains a blog for entrepreneurs with a specific focus on SaaS business as well as Joel York that brings lots of financial mathematics to the game. He also addresses something that I have not seen anybody else do which is the concept of Net Present Value (NPV) in the calculations. What many ISVs forget is to keep their Customer Acquisition Costs (CAC) down as much as possible as many ISVs are still used to the old model where the prospect/lead needs lots of human interaction before the deal is closed. This is no longer possible in scenarios where the price is on a level that the ISV can never achieve break-even with providing too much support in the deal closing. 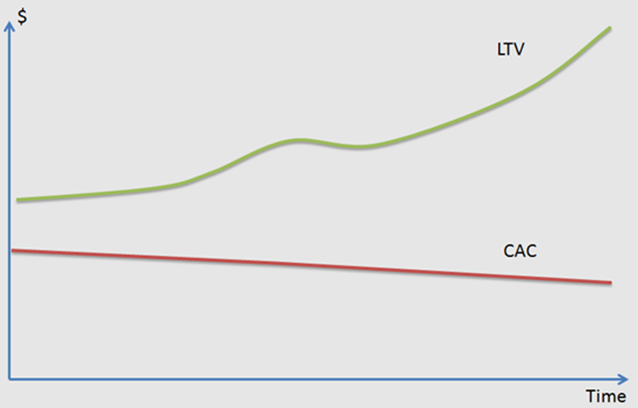 If you look at the Customer LifeTime Value (LTV) and Customer Acquisition Cost (CAC) figure below, the trend needs to be according to the following picture. If the ISV did not control the CAC, it would very soon run into a situation where LTV and CAC are getting closer to each other and the ISV would be bleeding money. 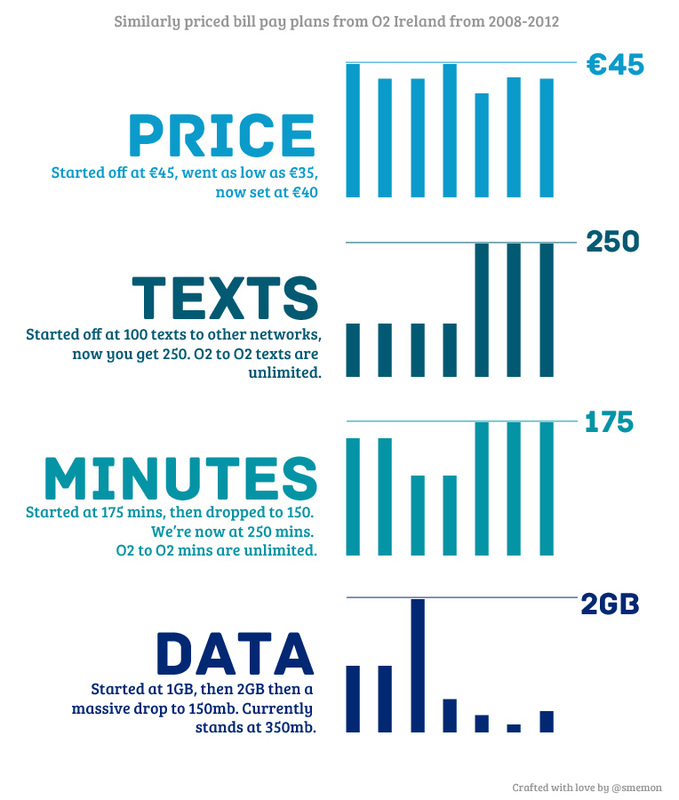 Following picture from Joel York gives an even more interesting view how Customer Acquisition Costs (CAC) combined with Churn will impact an ISV and how each customer adds to the accumulated CMRR until it covers the accumulated CAC cost. In the picture the sixth client creates a situation where company becomes profitable. The picture also shows how churn will impact the overall MRR with time. The picture gives us an idea how CAC and Churn plays a central role in SaaS financials, but there are many other financial measures that an ISV should think of and also measure. Skok provides an interesting breakdown in how key SaaS goals can be divided into different components: Profitability, Cash, Growth, Other (like Market Share) and each one of these components can be divided into smaller components. 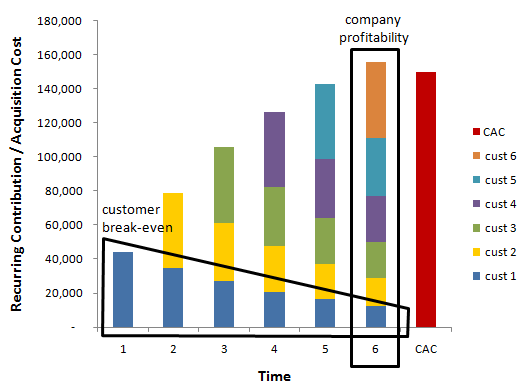 When you view the picture in more detail, you can see how Customer Acquisition Costs (CAC) and LifeTime Value (LTV) drives the customer profitability, Monthly Recurring Revenue (MRR) and Services Revenue drives the overall revenue and when you add expenses and COGS to the formula, you will have the regular accounting related profitability. Measuring your employees can be done from many perspectives and I will address sales measurement separately in a later blog entry. As we can see, there foundation for an ISV is still the same, to generate ROI for the investment and dividends for the shareholders. What has to change is how and ISV measures the operational activities when running a SaaS business. 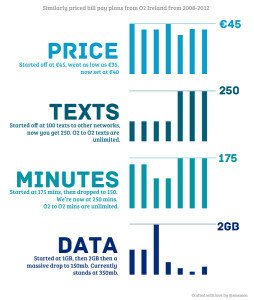 ISVs that have not made the move towards the Cloud might really have issues with their competitiveness going forward. My recommendation to mature ISVs is to start looking what can be done in the cloud world and get the development team focused on the changes that a pure Cloud solution will require to be truly multi-tenant so the ISV can achieve the scalability benefits of a PaaS platform such as Windows Azure. Stay tuned for more about metrics and changes in operational models for an ISV.